I've always been a go-getter. But a few years ago I noticed a lot of my go-gettting never really went anywhere. I would look at my end of the year pay statement and wonder where all my money went. I would look back on my resolutions for the year and realize they all fizzled out around February. I wondered why I couldn't really make things happen for myself and why I wasn't getting out of debt. 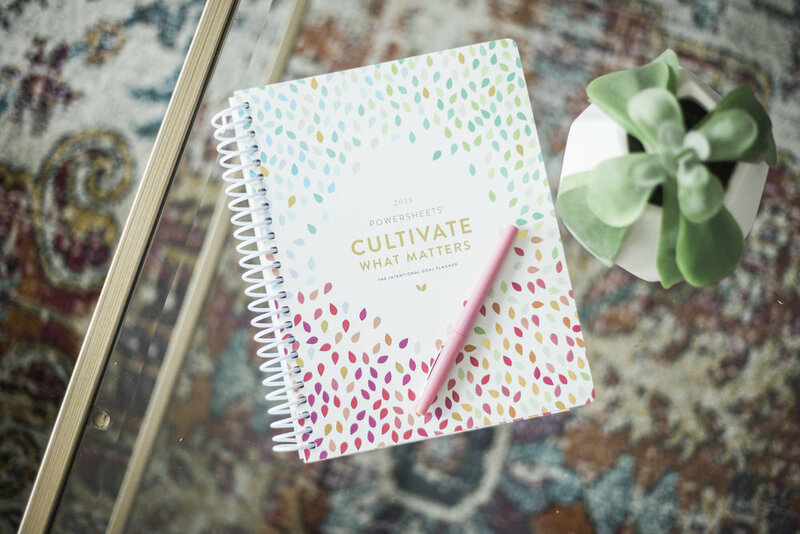 And then a friend posted about the Lara Casey Cultivate What Matters Goal Planner and I was intrigued. A little skeptical at first but I dug in for more info and I am so glad I did. Setting goals is so important for your life, but if you're anything like me, you have been setting the right kind of goals the wrong way. Big goals need big plans and big plans are made up of a lot of very small action steps. And that's where the CWM goal planner comes in. Lara gives you a practical blueprint for goal setting and achieving that works. It's not all fluff and lists and stickers and rainbows. It's hard work. It's reaching deep down into the dark parts of yourself that hurt and that hinder and brings those things into the light where they can be set free and healed. In fact, the first 33 pages of the planner aren't planning at all. It's a space for an honest self assessment, where you are in the present season and practical ways to help you grow into the person you want to be. I did a FB and IG live today covering just the first few pages and my thoughts. For those of you who missed the LIVE and want more info or for those who cannot afford a goal planner this year, I am going to walk you through the pages I covered so you can come back to reference if you need it. Step 1: Doodle your ideas. This isn't a perfect list of your actual goals. This is just a page for you to write out what you think matters most in this season and a few ideas you want for the next year. Be messy here! Step 2: Get to know yourself. How would you describe yourself? What are the ways you are most encouraged. What are the things you love to do? When do you feel most motivated? What are you most grateful for? Step 3: Break Your Identity Box: "What about you have you knowingly decided that you cannot do" - Lara Casey. Use this space to write out the things you feel you have been labeled as, that you no longer want to be labeled. Step 4: Imagine the possibilities if you were to break your identity box. What would happen if you smashed the stigma someone else or the enemy has placed on you? Step 6: Write the story of where you started to where you are now in just a few words. Step 7: Why I want to make what matters happen in 2018... use this space to write your why. Step 8: Rate each of the following areas of your life from 1 to 10. 1 Being the area where you want the most change and 10 being the area where you feel most solid. Then write out a few thoughts on why you ranked the area what you did and what you want to change if change is needed. You did it!! You accomplished the first steps towards becoming the you, you have always wanted to be! These are the most important steps in setting goals and smashing them so be proud of yourself and how far you have come today! I will continue to update on the goal planning process here on the blog as well as LIVE over on FB! Follow the link here to join the group and get goal planning with us!